Yet again we saw a breathtaking performance from Usain Bolt of Jamaica in World athletic championship in Berlin on 16th Aug 2009 and improve his own world record of 9.69 seconds which he made in Beijing Olympics last year. Meanwhile his unbelievable performance make critics doubt about the sprinters capability without any performance enhancing drugs like that of great sprinters Ben Johnson, Justin Gatlin, Tim Montgomery, Marion Jones but only time will tell the truth until then we only wish Usain Bolt Good Wishes. 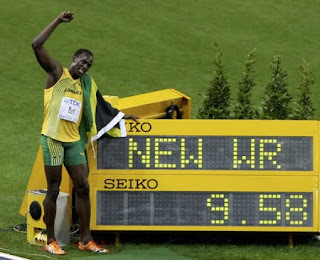 In 200m also he set a new world record and also won 4X100 m relay for Jamaica. Hard work never fails !